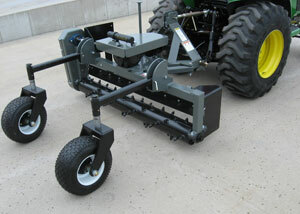 Designed for use by contractors, municipalities, institutions and farmers. Hydraulically driven models for skid steers and front loaders, PTO driven models for 3-pt tractor mounts (Cat.I). 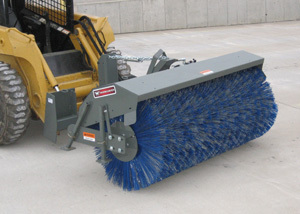 32 inch diameter convoluted brushes available in Poly (P) or both Poly and Wire (PW). All models available in 5-ft., 6-ft., & 7-ft. widths. Designed for skid steers and tractor front loaders, heavy duty snow blades remove snow easily from driveways, parking lots or other large areas. Available in 5, 6, 7½ and 9 foot widths. 7½' and 9' blades feature 5 degree lateral oscillation allowing these wider blades to easily follow the ground contour. 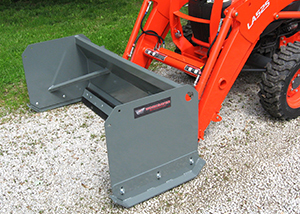 SBS models utilize the "Universal" skid steer mounting system. SBFL models offer interfacing brackets for most tractor front loaders. SBC models easily install on compact tractors by clamping onto the bucket for fast snow removal. 20-Series Performance matched to fit Sub-Compact tractors up to 32 HP. 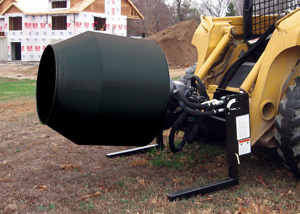 Models available with the "Universal" skid steer attach method, which is used on most sub-compact loaders today. 24-Series Engineered to fit Sub-Compact and Compact tractors up to 50 HP. These snow pushers are job matched to the tractor for maximum performance. 36-Series Engineered for Skid Steer loaders and Utility tractors from 50-125 HP. (depending on model). These Snow Pushers consistently deliver the high performance today's large property owners demand. 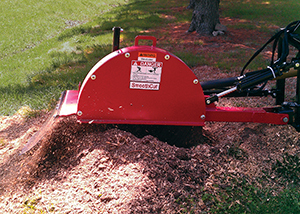 Economical and efficient PTO powered stump grinders make stump removal fast and easy. Operator easily controls the grinder from the comfort of the tractor seat. SurefootTM stabilizer provides secure footing during operation. Cutting wheel design provides a smoother cutting action and increased productivity. 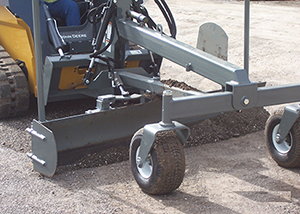 The patented SSGB-8B Grader is designed to be used by asphalt, landscaping, and concrete flatwork contractors. The unit has a 8-foot, six-way hydraulically controlled moldboard operated by an in-cab remote. With an optional laser system, the grader will maintain grade to tight tolerances. Worksaver’s Skid Steer Mixer, model SS-590 has direct hydraulic drive of the gearbox which eliminates chain and sprocket maintenance resulting in more up-time on the jobsite. Large 11-cubic ft. drum allows the operator to mix, transport and place 5-cubic ft. of concrete. It’s efficient design offers the contractor a cost savings over chain driven models. Power rakes are ideal tool for the landscape contractor, large property owner, rental yard, park & recreation department or turf management professional. They do it all, prep, smooth, set grade, level, till, remove rocks and create the perfect seedbed making this tool a game changer. 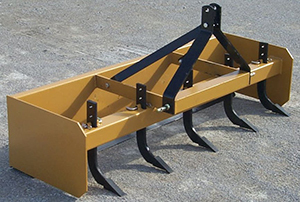 If you need a box scraper to perform site preparation or restoration, or use for applicable farm practices, then our heavy duty box scrapers are what you need. They are ruggedly built with the features you need. The scarifier height can be adjusted to loosen the soil at a desired depth or raised out of the way. Each box scraper has a reversible cutting edge to scrape material into the box area.